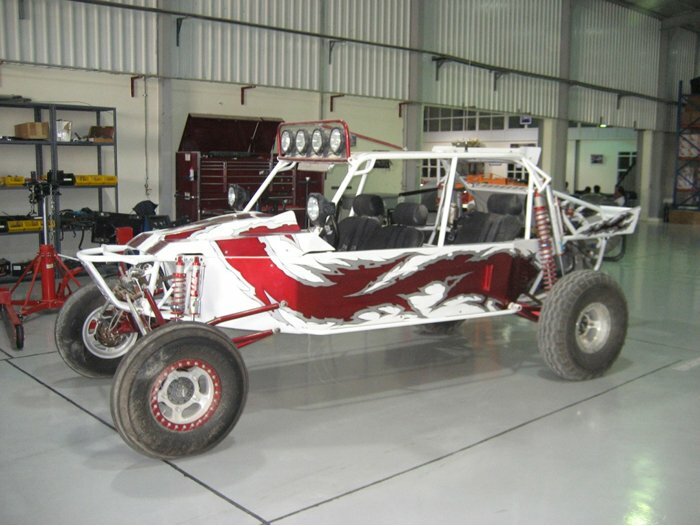 DOHA, QATAR (February 18, 2011) – A remarkable 2010-2011 season in the Arabian Drag Racing League ended in fitting fashion for Pro Nitrous driver Khalid Al-Balooshi. Al-Balooshi’s record-breaking year ended with one more brilliant salvo, too, as the victory earned him $100,000 for the championship. Add the $50,000 he earned for winning the points title and the $20,000 he earned for ending the year with both the E.T. (3.781) and speed (199.88 mph) records, and Al-Balooshi picked up $170,000 in one weekend, making it the most lucrative win in doorslammer history. “I want to thank everyone on my team and to Sheikh Khalid Al-Thani for giving me the opportunity to do what I love,” Al-Balooshi said. Al-Balooshi wasn’t the only competitor smiling on Friday. After struggling the majority of the season, Pro Extreme driver Von Smith and his Barwa Racing team put it all together at the perfect time, going 3.65 at 209.92 mph in the finals to beat Todd Tutterow. Smith’s consistency on Friday won out over record performances – Matt Smith went a PX-best 212.83 mph in a first-round victory against Alex Hossler – and hole shots, giving him $100,000 in the process for the win. In Extreme 10.5, Dan Millen’s magic is now going on six months, as he followed up his World Champion in the American Drag Racing League (ADRL) with a world title in the ADRL’s sister league. This one came in dramatic fashion, as Millen, who has had his Mustang dialed in since September, went 3.80 at 204.29 mph to beat Frankie Taylor’s 3.879 in the quickest side-by-side XTF race in history. The win netted Millen $50,000 for the championship, plus an additional $25,000 for the points title and $5,000 for setting both records, giving him an impressive $80,000 over the weekend. Terry Schweigert posted the better time (4.137) and speed (173.61 mph) in the Pro Extreme Motorcycle finals, but Meshal Al-Saber had the better reaction time and ended with the PXM championship and a $50,000 purse for the victory. Al-Balooshi had a bye to the semifinals because of his points title, following that with a strong 3.783 at 199 mph against Mahanna Al-Naimi in the semifinals. That set up the marquee matchup most expected, as Al-Balooshi met the legendary “Iceman” in the finals. Jenkins went 3.80 in the semifinals after a first-round win against Isaias Rojas, but was too quick off the line against Al-Balooshi. It might not have mattered against Al-Balooshi and his team, which has raised the bar in Pro Nitrous all season. “I don’t know what to say. I just can’t believe it,” tuner Brandon Switzer said. “I just want to thank everyone on our team and especially (Al-Balooshi). I have had the pleasure to work with a lot of the top drivers in Pro Nitrous and Al-Balooshi is one of them! Considering the record-breaking runs from Matt Smith and the strong racing all season from the likes of J.R. Todd and Alex Hossler, Von Smith and Tutterow were hardly the favorites on Friday. But Tutterow was stout on the starting line, earning holeshot victories against Taylor in the first round and Matt Smith in the semifinals, running a 3.67 against Smith. Von Smith, though, had his three runs come within a hundredth of a second of each other, going 3.656 in a first-round win against Joshua Hernandez and 3.646 at 210 mph in a holeshot win against Todd in the semifinals. That set up a marquee matchup in the finals, but Smith’s consistency won out. Speaking of consistency, Millen never strayed far from 3.80, going 3.811 in the semifinals against David Hance to set up what was an epic race with Taylor. Schweigert, the No. 1 qualifier in PXM, seemed destined for his first World Championship after he went 4.117 in his semifinal victory against Matt Smith. But Al-Saber, who beat T.T. Jones and Rob Hunnicutt to advance to the finals, was too quick off the line, giving the Kuwaiti a chance to celebrate. Pro Extreme Battle For The Belt — Von Smith, Camaro, 3.650, 209.92 def. Todd Tutterow, Camaro, 3.715, 208.30. Pro Nitrous Battle For The Belt — Khalid Al-Balooshi, Camaro, 3.786, 199.70 def. Shannon Jenkins, Camaro, foul. Pro Extreme Motorcycle Battle For The Belt — Meshal Al-Saber, Suzuki, 4.149, 168.64 def. Terry Schweigert, Suzuki, 4.137, 173.61. Extreme 10.5 Battle For The Belt — Dan Millen, Ford Mustang, 3.800, 204.29 def. Frankie Taylor, Chevy Corvette, 3.879, 190.46.